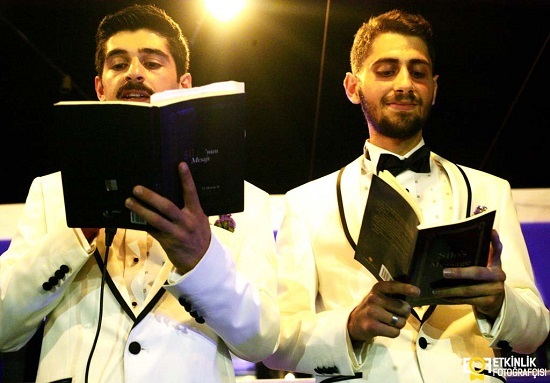 This is the story of a gay couple who recently wed in Istanbul in an alternative ceremony not officially recognized by the government: Confronted with a heterosexist system, we did not stay in the closet. In their white tuxedos, they go well with blue. With a terrific smile on their faces, they could paint this country with dreams if you let them. Now you will read about it. It is not one of my stories; it’s a story of love. On 2 September 2014, Ekin Keser and Emrullah Tüzün crowned their life together with a wedding. What made their wedding different from others is the fact that they are a gay couple. Ekin, would you tell us about yourself? At the moment, I am studying at the fine arts department of a university. In other words, with my marriage I have fulfilled both dreams. As for Emrullah, he is 27 years old. His family migrated to Istanbul when he was two years old. He works in the service industry and loves to take photographs. Do you think of the moment you met Emrullah as a coincidence? How did you become acquainted? It certainly was a coincidence (he smiles). My first encounter with him was two years ago on 22 September at a coming-out party in Taksim. The beginning of our relationship coincides with that moment. Shortly after getting to know each other, we began to share the same home. When you began to share the same house, did you feel afraid that people in the vicinity would “know about you”? That did not happen, since I am as open about my homosexuality to the people around me as I am to my family. They knew about my relationship with Emrullah. I did not hide the feelings I had for him. Really? You were able to experience the freedom that your love brought in the way you wished? That was our experience. Confronted with a heterosexist system, we did not stay in the closet. We reflected our feelings, even through our outward appearance. We touched each other, we embraced each other, and we did not refrain from holding hands. Did your families know about your sexual orientation? My family knew about it. Emrullah, however, came out to his family later on. When they learned of your relationship, how did they respond to this situation? They regarded it as an ordinary relationship. They did not think of it as long term. One of you is of Arab ethnicity; the other, Kurdish. These two different ethnic origins, two separate cultures… Did you get a reaction from your relatives? We got a lot of reactions. In fact, some people went so much to the extreme that we received death threats. We paid no heed to them when they said, “Fine, you have gone this far. From now on, stay in the closet!” From Emrullah’s family, however, we did not encounter any hateful attitudes. At least now they are exhibiting a moderate stance (he smiles). The proposal came from Emrullah. This was a rather big surprise for me. What kind of proposal was it? Ordinary, or the kind that leaves a lasting impression? On the day we got engaged, I procrastinated for so long until I left work late (he smiles). When I arrived in front of the door, I came upon a surprise hanging there. On a piece of paper, it was written, “Bekbek loves you so much.” (“Bekbek” is what we call each other) When I opened the door and entered, a flower hanging on the wall caught my eye and attached to it another piece of paper. What the note on the piece of paper was is now completely erased from my mind because of the excitement, because the voice recording on the laptop is in my memory. Emrullah proposed to me and afterwards approached me with our rings. Our friends, too, who were hiding in our home, kept us company that night. This was very exciting for me. I felt very special. I am curious about the excitement preceding the wedding arrangements. Would you tell us about it? Groom attire, invitations, location, etc. What was the commotion like? Leaving aside the excitement of marriage, it was tiring. The design of the invitations was up to us. It was every bit a manual effort. We prepared the design; one of our close friends did the cartoon drawing. For the location, we decided on a yacht, with help from of one of our friends, since the sea meant freedom, because in my mind there had not been the question of whether we would be exposed to the danger of homophobia from the surroundings, I would have wanted to do the ceremony in a villa garden. That was my dream, I can say. The search for groom attire kept us very busy. There is hardly a place we did not go and take a look at (he smiles). With the choice being made by a childhood friend of mine, our groom attire was settled, and when we put it on it looked rather good on us. Was attendance at the wedding what you expected? Were there those who offended you by their absence because you had expected them to attend the ceremony? We restricted the invitations to 120 people. The attendance was what we expected. The people whom we loved and who supported us were there. I did not feel the absence of those who did not come. There were attendees from activist friends of ours as well. Yes, of the leading members of the family, I had the company of my cousins. I don’t think we took traffic into account. We got stuck in traffic and thought we were going to be too late for our own wedding. We took a breather on the ferry. Our maids of honor and our best man were with us. People were looking at us. In fact, at the Eminönü ferry quay, when we started eating some chocolate to suppress our hunger, a woman pointed us out to the people in the vicinity and said, “Look! Look! They’re filming an ad.” What was most interesting, however, was the fact that at the start of the ceremony, a Syrian woman came to me and, indicating Emrullah, asked, “Is he your husband?” This question made me and Emrullah very happy. If adoption rights were granted to gays and lesbians in Turkey, would you become parents? Our family is relatively large. We have a dog and two cats (he smiles). Of course, why not? If the people who persist in not recognizing gays we want to adopt one or two children. Our interview almost having come to an end, we ought to ask the following question. Since this was not a marriage based procedurally on the signatures of the parties involved, have you encountered an attitude such as “Why did you attempt such a thing?” If so, I am curious about your response. Furthermore, if gay marriage were to be legalized in Turkey, what would change? Yes, there have been people from certain circles who had this kind of an attitude, but what made our wedding ceremony special for us was the realization of our dream. Our happiness and excitement was too intense to describe. If it were understood in Turkey that we too are persons, we would have the very rights that are granted to married heterosexual couples. I sincerely believe that this will happen.